We have a comprehensive list of treatments that are all competitively priced to ensure excellent value for money, whilst always maintaining the highest standards of care. At Feet First, our chiropodists will carrying out a one to one consultation before recommending the most effective course of treatment for you. It is recommended that you attend regular visits to a chiropodist or podiatrist as many foot problems can be diagnosed and treated in the early stages eliminating unnecessary pain and suffering. This is a fungal skin infection of the foot. It is more common in sportspeople who regularly use communal bathing areas. The fungus prefers to live in warm, moist environments and this is why symptoms will often appear first between the toes. It can easily be passed from one person to another. A rash that is scaly and itchy may appear and this may become red and sore if it is left untreated. The rash may spread to the sole of the foot. What are the causes of Athlete’s Foot? Fungal spores manifest themselves in the skin of the foot. The spores can be contracted anywhere, but it commonly occurs in moist environments, such as at the swimming baths. What should I do if I have Athlete’s Foot? A consultation with a podiatrist is advisable the first time that symptoms appear to obtain the correct treatment promptly. Wearing clean cotton socks, breathable footwear and avoiding moist, sweaty environments for your feet is advisable. What shouldn’t I do if I have Athlete’s Foot? Wearing old trainers which do not allow your feet to breathe can worsen the problem. Could there any long – term effects from Athlete’s Foot? Athlete’s foot is not a serious infection and can be treated quickly and easily with an antifungal cream, spray or powder. However, the fungal skin infection commonly spreads to the toenails, leaving fungal nail infections which can be more difficult to treat. A Podiatrist can advise on the most effective treatment for your symptoms, as well as providing information about how to avoid the problem returning. Simple steps to reduce Athlete’s foot from recurring include; washing toes and feet daily and thoroughly drying between the toes to avoid a moist home for the fungus to thrive, changing socks daily and alternating your footwear, and wearing flip – flops when at the swimming pool or other communal wet areas. A bunion or Hallux Valgus refers to the condition in which the big toe is angled excessively towards the second toe, rather than pointing forwards in a straight line. Over time, this excessive angle gives the appearance of a ‘bump’ on the inside of the big toe joint. This bump is called a bunion. The bunion may appear red and swollen. Sometimes they cause pain, this depends on the type of footwear being worn, the amount and type of activity a person does and how excessive the big toe is pointing towards the second toe. Thick, hard skin (callus) or corns may appear over the bunion due to excessive pressure from footwear. It may be difficult to find footwear that is wide enough to accommodate the enlarged joint. What are the causes of a bunion? There are a number of reasons a bunion may occur. The main cause is often shoes that do not fit properly. Tight, narrow, high heeled shoes cause great strain on the big toe joint. Due to this style of shoe commonly being worn by women, this makes the condition more common in women than men. There is evidence to suggest that bunions run in families, often due to an inherited biomechanical problem. Bunions can be caused or made worse by arthritis in the joint. If you have a bunion then an assessment by a podiatrist, physiotherapist or an orthopaedic surgeon may be necessary. Often bunions can be managed conservatively, though some may require a referral for surgical correction. What shouldn’t I do if I have a bunion? Over time, bunions usually become larger and more painful. It is difficult to predict how fast this will occur. Certain types of activity should be reviewed and an alternative form of exercise may be preferable. High heeled, poorly fitting shoes should also be avoided as these can exacerbate symptoms. Could there be any long – term effects from a bunion? There is a danger that the smaller toes may be affected as a result of a bunion, due to the malalignment of the big toe joint. They may change shape or start to overlap. A fluid-filled space called a bursa may also develop under the skin over the bunion which can be painful. Early conservative management can help to slow the progression of the condition, though surgery may the preferred option to resolve the problem. Advice about suitable footwear can be provided by a podiatrist which may help to slow the progression of the condition and make it more comfortable. Corns or callus that may appear over the bunion can be removed by a podiatrist. Silicone gel appliances can be provided to cushion and protect the bunion. If these conservative treatments provide an inadequate level of relief, a surgical referral will be required. What are Callus and Corns? This is an area of thickened, hard skin that may appear yellowish in colour. It can occur in a number of places on the foot, commonly on the heel area. Corns are smaller areas of hard skin, roughly round in shape, which press into the skin often over high-pressure areas. What are the symptoms of Callus and Corns? Callus doesn’t always cause pain, it may just appear unsightly. It appears as roughened skin that may be discoloured. Corns may be visible in between toes, on tops of toes or on the sole of the foot. Corns are commonly painful, some people describe the pain as ‘walking on pebbles’. What are the causes of Callus and Corns? There are a number of causes for callus to form, these include; excessive pressure over boney areas, poorly-fitting shoes and excessive walking or running. However, some people have a naturally excessive production of callus for no obvious reason. Causes for corns to form are similar to those for callus – pressure, footwear and high levels of activity. What should I do if I have Callus or Corns? If your callus or corn is painful or it appears unsightly to you, you should seek treatment from a podiatrist. What shouldn’t I do if I have Callus or Corns? It may be dangerous for you to try to remove callus or corns yourself with a sharp object, we strongly advise against this. Could there be any long – term effects from Callus or Corns? No, callus and corns are not serious conditions, though they do tend to recur after they have been removed. Callus and corns can easily be reduced by a Podiatrist using a scalpel blade. This pain-free treatment aims to reduce pain or discomfort, restore normal appearance and improve skin function. Foot problems commonly develop where a person has Diabetes, and are often more serious than in a healthy individual. High levels of blood glucose over a long period of time can result in harm to the body and its functions. In the feet, the nerves and the blood supply may both be adversely affected as a result of diabetes. Nerve damage in the feet and legs may cause a loss of sensation. Any trauma or injury to the foot, for example standing on a sharp object, may not be felt and could lead to more serious complications such as an ulcer. Diabetes can lead to a restricted blood supply in the feet and legs which may affect the ability to heal if there is an injury to the foot. The feet may appear cold and pulses will be weak where circulation is poor. A Podiatrist can advise on a number of things that a person with diabetes can do to help avoid complications with their feet. Examining the feet daily for cuts/swelling/scratches or discolouration. Washing the feet daily and drying thoroughly but gently. Avoid burning the feet. Due to reduced sensation, burns from hot water for example may not be felt. Care when cutting toenails – if eyesight, sensation or circulation is impaired it is advisable that a Podiatrist cuts toenails. Corns and callus should be treated by a Podiatrist. Footwear should fit well, and shoes should be checked before wearing each time to see that there is nothing that could cause irritation to the foot such as a stone. Stopping smoking can be helpful as circulation is worsened in smokers. It is important for a Podiatrist to monitor any deterioration in the nerves of the feet or circulation. This allows the patient to take the necessary precautions to help avoid any complications. What is an Ingrowing Toenail? An ingrown toenail is where the edge, or corner, of the toenail grows into the adjacent skin (the skin next to the edge of the nail) and pierces the skin, causing the toe to become red, swollen and tender (inflamed). Ingrown toenails are common, with the big toe most likely to be affected on one, or sometimes, on both sides. The toenail curves and cuts into the skin, causing the toe to become tender and painful, particularly when you walk on it. If left untreated, the toe can become infected and leak pus. These can occur in any age but commonly teenagers and young adults present with this problem. What are the symptoms of an Ingrowing Toenail? An early symptom of an ingrown toenail is hard, swollen and tender skin surrounding the nail. Later, the skin around the nail may appear red, inflamed, painful and there may be signs of pus or bleeding if infection is present. What are the causes of an Ingrowing Toenail? There are a number of causes for ingrowing toenails, these include; narrow fitting footwear, a poor nail cutting technique and a nail with naturally curved edges, rather than a flat nail. What should I do if I have an Ingrowing Toenail? Immediate treatment with a podiatrist should be sought to remove the piece of nail that is pressing into the skin. If it is not acted upon quickly, the problem worsens as the nail grows in deeper and becomes more painful. What shouldn’t I do if I have an Ingrowing Toenail? Ignoring the problem should be avoided as it often worsens in time. Wearing wide fitting shoes to keep pressure off the toes is advisable, high heeled, narrow shoes should be avoided. Could there be any long – term effects of an Ingrowing Toenail? The problem frequently reoccurs, if conservative treatment by a podiatrist is not providing adequate relief, nail surgery may be required, where a podiatrist removes part or all of the nail under local anaesthetic. This provides a long term solution to the problem and avoids the chance of frequent flare-ups and associated infections. A podiatrist will carefully cut back the offending piece of nail. Advice regarding suitable footwear, nail cutting and cleanliness will be provided by the podiatrist to help prevent the problem from recurring. If the nail regularly becomes a problem then removal of part of the nail under local anaesthetic may be required (nail surgery). Low level laser therapy is a safe, non-invasive application of laser light to the skin, used for just a few minutes per session with variations of pulse and frequency to gently kick start the body’s natural healing process. Put simply the manipulation of light promotes improved cellular function, healing of the skin and pain relief, with no sensation or side effects. Some of customers say they feel a difference after the first treatment but we highly recommend a series of treatments to make a difference to your condition. Your laser treatment will be provided by our friendly, fully qualified podiatrist. Think of it as gentle, faster healing through light…. Nails are cut, filed, cleared and reduced (ground down to a normal thickness) as part of the basic treatment. Verrucae are warts that occur on the feet. They are the same as warts on any other part of the body. Verrucae are common in children and are generally harmless and pain-free. What are the symptoms of Verrucae? Verrucae are small, rough, often round, lumps on the skin. Sometimes you will only see one or two verrucae on one or both feet, though they can cover larger areas of skin. What are the causes of Verrucae? Verrucae are caused by different strains of the human papilloma virus (HPV). The virus is present in the skin cells of a wart. Close skin to skin contact, particularly in a wet environment like at the swimming pool often results in the verrucae being spread to others. You are more likely to catch the infection if your skin is: damaged, wet, or comes into contact with rough surfaces. What should I do if I have a Verrucae? An assessment with a podiatrist is recommended if you have a verrucae to identify whether treatment is necessary. Any over-the-counter treatment should be used with caution. What shouldn’t I do if I have a Verrucae? Do not go barefoot at the swimming baths to avoid spreading the virus. Do not use any sharp objects to try to remove the verrucae from your foot. Could there be any long – term effects of a Verrucae? Verrucae often spread to other parts of the foot, however, they generally clear up themselves without any treatment over time. They are not serious and should be ignored if they aren’t causing any problems. Overlying hard skin that may develop over the verrucae can be removed by a Podiatrist to relieve discomfort. A Podiatrist can advise on the appropriate management plan for your verrucae. Flip-flops or verrucae socks are advisable to both prevent catching verrucae at the swimming pool and passing them on to others. Chemicals can be applied to the verrucae to help clear it, however if the verrucae is not causing a problem it is advisable to leave it untreated as the body’s immune system often recognises it and responds. removal of hard skin, callus and moisturising. Call us today with your bookings or queries! *Please note that, effective 1st February 2019, there will be a price increase of £2 on all treatments. Feet problems can develop from various reasons some are inherited, others are revealed due to illnesses, middle age, or most popular from the pressure of ill-fitting shoes. At Feet First Chiropody Birmingham, our clinics provide the highest level of care. We specialise in providing regular routine maintenance to keep your feet comfortable, advice on a particular condition or just a 6 monthly ‘MOT’ that will be tailored to your particular need. Here at Feet First we offer a complete Chiropody/Podiatry service in the comfort of your OWN HOME treating all complaints concerning the feet with the exception of bone surgery. Not only can we deal with ailments such as nails, corns and hard skin. We are qualified to treat a wide range of conditions including posture related problems, diabetes, back and leg pain, arthritis plus much more. If you are diabetic, you should be receiving an annual foot check with your Doctor/Practice Nurse. However we automatically carry out a diabetic foot check and provide the necessary foot care advice. 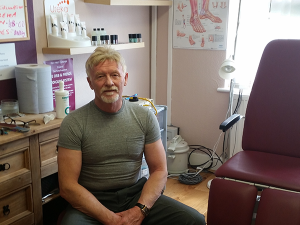 Our chiropodist Alan has a strong regional profile and is a certified Chiropody in the north Birmingham area, with over 20 years of experience. He is known for his high quality service and skills. Any concerns regarding the health of your feet? Do not hesitate to give us a call, Alan is available for effective diagnosis and treatment of a wide range of conditions. Alan understands that not all his patients can come in to the practice for treatment, this is why he also has a home visiting service. If anything else is missing from this list please contact Alan. If you have an elderly relative or friend who is in need with any treatments please do not hesitate in getting in touch. Alan is a very understanding person who will help any way he can. It is important elderly people pay special attention to their feet. Older feet tend to develop more problems naturally, this is due to the thinning of skin. Due to wear and tear, heeling often takes longer. To book an appointment call: 0121 386 3791 or fill in the form below.